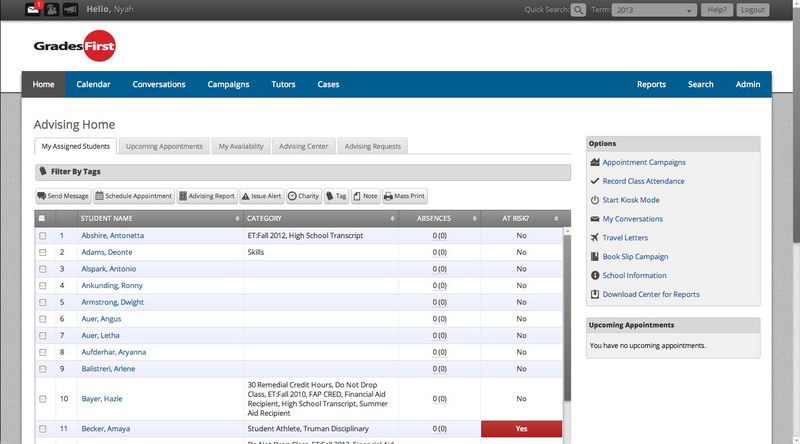 GradesFirst is a student support system for colleges and universities. It is primarily used by advising units and tutoring centers to manage their day-to-day operations. GradesFirst helps them to manage appointments, take notes on students, and send precisely targeted communications via e-mail, text, telephone, and Facebook. It also includes a module for early alert (identifying at-risk students before they flunk out), and tools to allow students to easily schedule appointments with advisors or tutors. I joined the team to learn the trade of web development, and worked there for about 3 years.